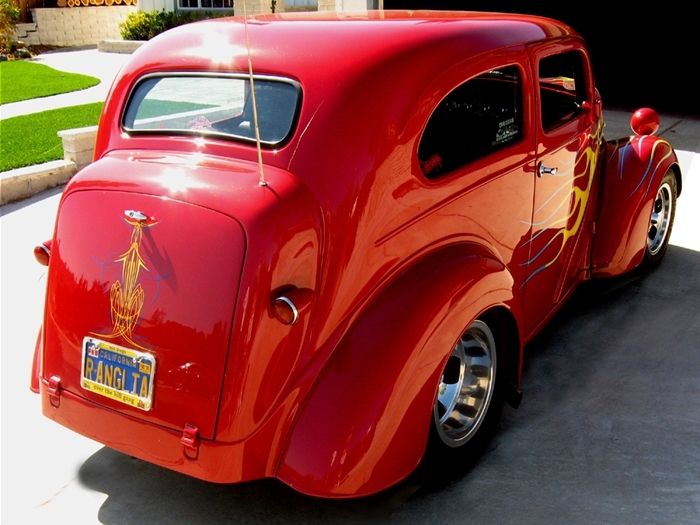 This Anglia has it all: looks, speed, and it gets 20 miles per gallon. But creating this jewel wasn’t quick and it wasn’t easy. 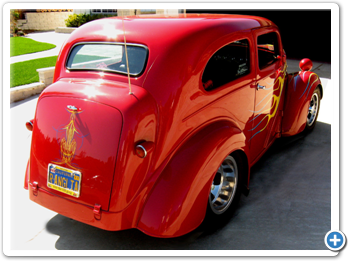 Gary Browne took a couple of decades building and then rebuilding his English Ford which is now on its fifth engine. “I got the car in 1975. It was just a frame and a body, no floor boards and no firewall. It had a Buick engine that was mounted horribly and a cut-down Chevy rear end that was really butchered. Somebody was trying to make it into a drag car that would have been a great failure. So I bought it for 750 dollars and started redoing it. It’s been done twice,” says Browne. 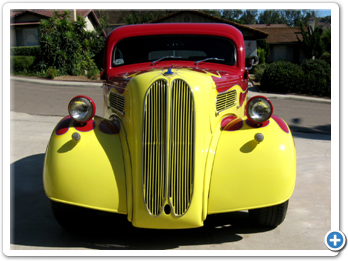 Browne’s first vision for the car was a cool looking hot rod with a modern four cylinder engine. At this point Browne made some serious changes including a Capri V6 2800 engine and four speed, a new firewall, new floorboards, and an independent suspension front end with disc brakes. This might have been the end of Browne’s rebuilding process except for one problem. The narrow floorboard had no room for his left foot. During that 1700 miles people would ask Browne, “Where’s the other two cylinders?” So to solve the floorboard problem he replaced the Capri engine with a small block Ford with an automatic. And that led to replacing the front and rear suspension. The Anglia has a short wheelbase as well as a short track width. So Browne needed to cut the rear end way down so it would squeeze underneath the fenders. But even that was not enough. The car fits Browne like a glove, although it would never do for an NBA player. 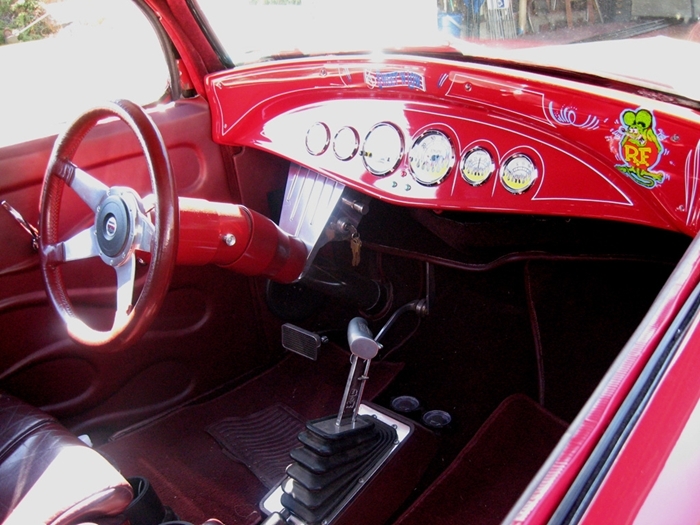 “The top has been chopped three inches and the floorboards raised four inches. So the car is missing seven inches inside, top to bottom. Anybody tall has a problem. If they recline the seat, they can fit in it but that’s about it,” Browne says laughing. The Anglia now has a good balance between performance, economy, and drivability. One of Browne’s biggest challenges was fitting the front and rear suspension under such a narrow vehicle. “The Mustang II suspension had to be narrowed 15 inches. For the control arms too fit, the frame had to be moved in two or three inches on each side which made it really skinny. It was a major job but you’ve got to make sure it’s right because if it’s not it’ll never go straight. But it was a kit from Fatman Fabrications and they have such beautiful directions it worked like a dream,” says Browne. Despite its light weight, the Anglia’s rear end grips the road. 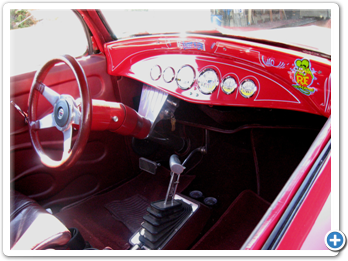 The Anglia’s interior is just as cool as the flames-over-red-painted exterior. 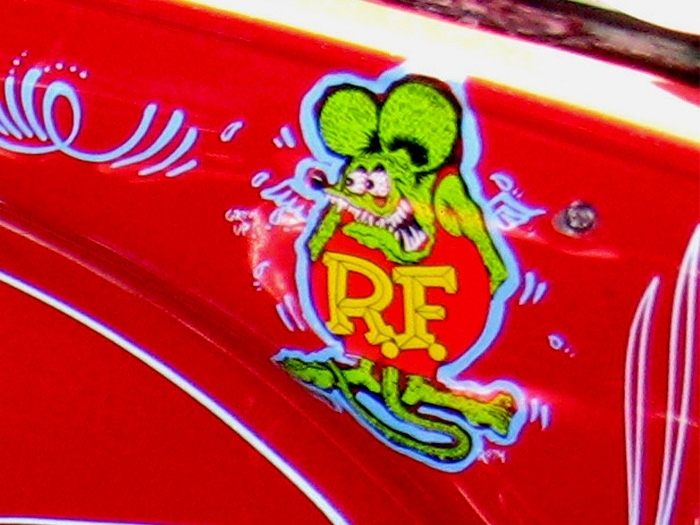 Ed “Big Daddy” Roth striped the dashboard complete with Roth’s iconic “Rat Fink,” who appears to be looking at the driver with a toothy but friendly grin. The front seats are from a Chrysler LeBaron. Browne chose them because they were the skinniest seats he could find. He had the other upholstery made to match, including a single seat in the rear. Summit Racing Equipment is the largest Internet supplier of high performance automotive parts and accessories. 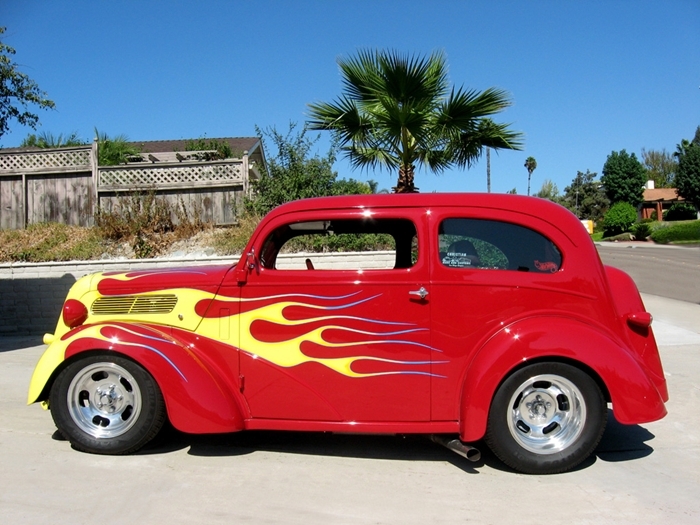 JEGS Performance Auto Parts has the largest selection of quality performance parts. 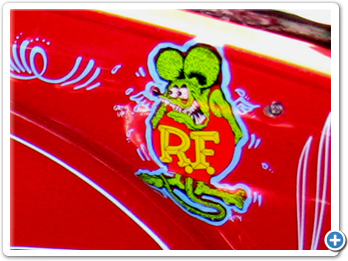 Fatman Fabrications has a large line of hot rod chassis products. Pick Your Part are self-service used parts yards with locations in Southern and Central California. Ecology Auto Parts are self-service used parts yards with location in Southern California and Phoenix Arizona. Illustrated with a superb selection of color photographs, this is the story of the Ford Motor Company in Britain--the cars, the people, the successes and the failures. Martin Rawbone tells how Ford came to dominate the British auto industry, through sound industrial practices and making cars that people wanted to buy. Ford historian Bill Ballard catalogs the small (8hp and 10hp) cars and their commercial derivates that were built by the Ford Motor Company in England and Australia. This book helps the enthusiast to precisely identify each marque and advises how to restore these cheap but charismatic little cars. 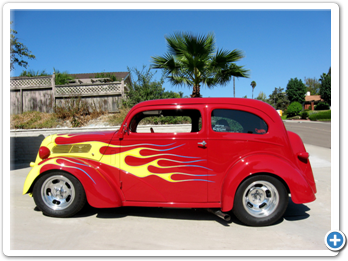 This book covers hot rods, decade by decade, from the teens through the 1990s. Over 440 pages with plenty of color photos. The Standard Catalog of Imported Cars provides a wealth of detailed information that collectors, investors, and restorers of imported cars will not find in any other book. It contains facts and figures on more than 130 marques of imported vehicles. Ford Model Ts were produced in Manchester, England beginning in 1911, and were followed by Model As beginning in 1928, just as in the United States. 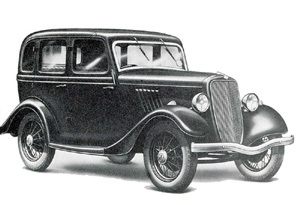 But British tax penalties for larger-engine cars, fuel costs, and Europe’s dense cities prompted Ford to design a smaller car resulting in the 933 cc, 8 horsepower Model Y which was produced from 1932 until 1937. 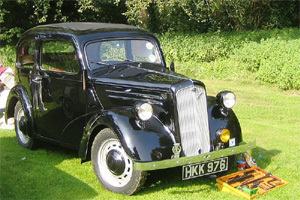 In 1938 Ford introduced the Prefect which was designed for the British market and built in their Dagenham, Essex plant. The Prefect was a generally a four-door sedan although some two-door sedans, coupes, and tourers were made. 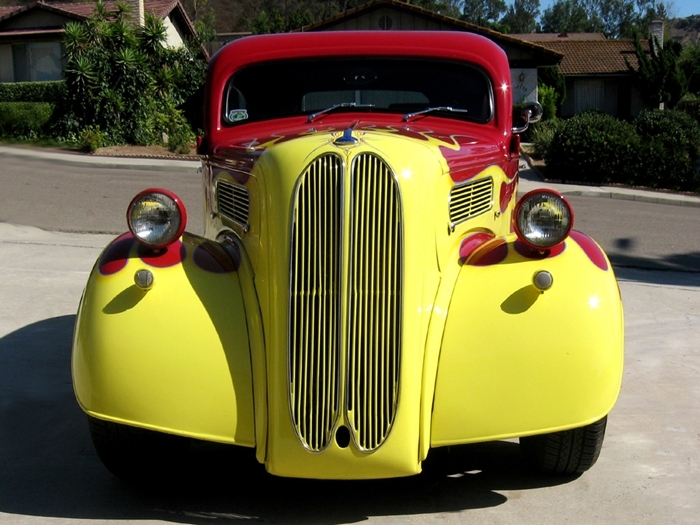 In 1939 Ford began producing the Anglia which became the two-door equivalent of the Prefect. 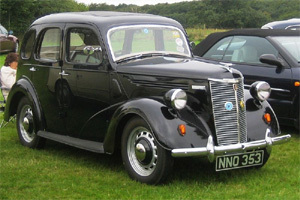 The Anglia was also sold as a van from 1940 to 1948. According to the Standard Catalog of Imported Cars 1946-1990 , the postwar Anglia continued with the 933 cc engine in Britain but those sold to the U.S. market came equipped with the 1172 cc version. About 3223 British Fords were sold in the United States in 1948. The 1948 body style was imported from 1948 until 1953. In 1954 Ford introduced a new body style for the United State but in England they continued the 1948 body style changing its name to the Ford Popular. In 1959 the Popular was replaced by a new version that was produced until 1962.